Antarctic Sound also know as, Iceberg Alley, is accompanied my views that can only be described as amazing. Huge open skies, enormous icebergs, low clouds, sudden weather changes and constant surprises from the hugely abundant wildlife you see will keep you in a constant state of awe. Travellers will discover colonies of Adelie penguins, and ice floes also provide a floating resting spot for various seals. The South Shetland Islands are a string of islands running parallel to the north west coast of the Antarctic peninsula. The South Shetlands are almost completely ice covered. About 2-3 percent is ice free, usually along the coast, where all life is found whether penguins, seals, or the human inhabitants of the various bases. The islands are frequently visited by tourist cruise ships and each has a different character. From north to south, the main islands are: Elephant Island, King George Island, Penguin Island, Bridgeman Island, Aitcho Islands, Greenwich Island, Half Moon Island, Livingston Island and Deception Island. New Island is one of the finest wildlife areas in the Falklands. This is largely because of the variety and density of bird life which lives there. The island's north and eastern coasts feature majestic cliffs, and some beautiful lower lying sandy bays. The island is a research center as well as a nature reserve and is home to a slew of wildlife including, Rockhopper penguins, South American sea lions and many other creatures for nature lovers and bird watchers to enjoy. West Point is one of the Falkland Islands in the South Atlantic Ocean. With a more rugged lifestyle than the military school of the same name, this small island has a stark beauty. Soaring tufts of tussock grass - some nearly six feet tall provide a sheltering habitat for rockhopper and Magellanic penguins and a large albatross colony. Southeast of the Falklands, South Georgia is lost in the midst of the Southern Ocean, one of the most remote regions on earth. South Georgia's climate is dominated by the freezing effects of the Antarctic continent 1,000 miles to the south. Glaciers coat more than half the island, and the scenery is spectacular, as if the Alps had been dropped down in the south Atlantic. 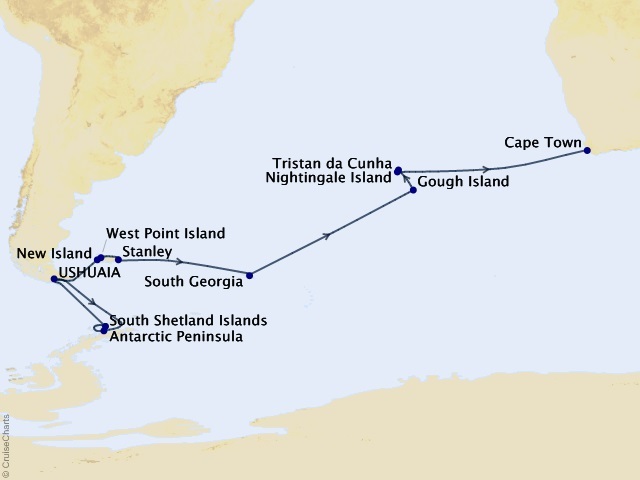 The only access is by sea, and the journey can take up to 10 days battling against south Atlantic gales. Often called "The Lonely Island", as it is some 1,500 miles from the nearest continental landmass. It was first settled by soldiers who had been based there during Napoleon's captivity on St Helena. Nightingale Island is the only island in the Tristan da Cunga Island chain that is accessible to visitors. The Island is know for two things; pirates and wildlife. For years, Nightingale Island has intrigued treasure hunters with its mysterious history. Nightingale has been said to contain pirate loot left behind by Captain John Thomas. Legend has it that he left a treasure of Spanish Doubloons and pieces-of-eight in caves on Nightingale for safekeeping. The island is also an important wildlife preserve known as a breeding ground for various types of seabirds. Visitors will see hundreds of Yellow-nosed Albatrosses, and Rockhopper Penguins.